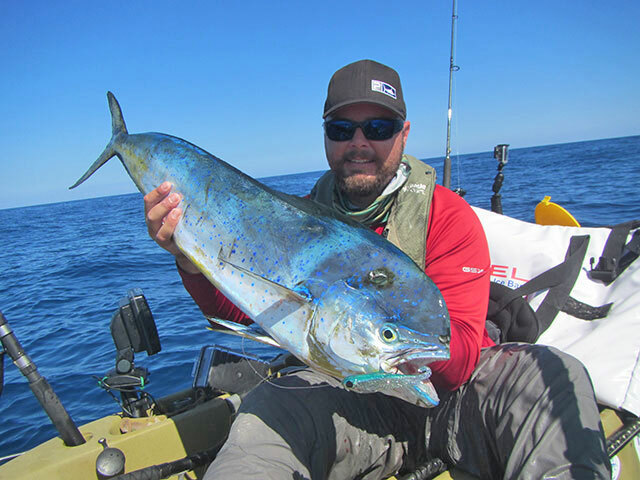 How to pursue big-game fish on kayaks..
Brian Nelli specializes in locating offshore game fish from a kayak. Staying safe and knowing where to go are the top factors when targeting big fish from a kayak. 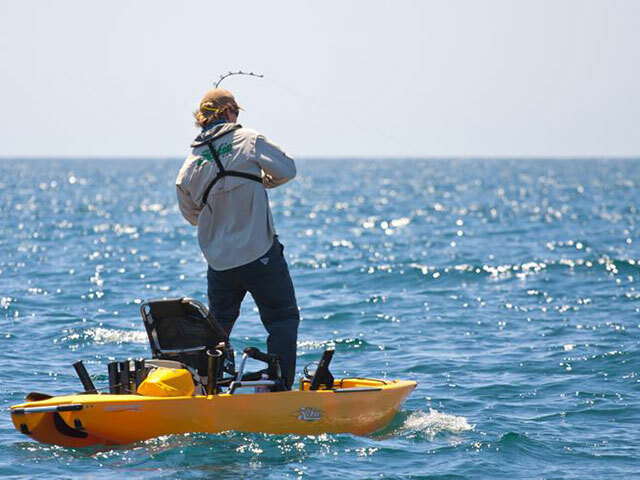 Many of today's kayaks offer pedal power so anglers can use their stronger legs to get offshore while keeping their hands free to fish. Many of today's boats, such as this Hobie Mirage Pro Angler 12, are also stable enough to fight fish standing up. 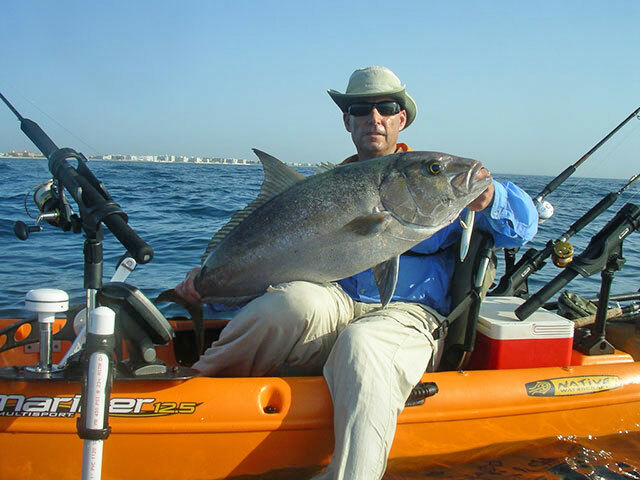 Kayaks provide an inexpensive way to get out on the water where you can troll, drift live bait, or drop jigs for big bottom dwellers like this amberjack. Having a chart plotter on the kayak will help you find bottom structure. 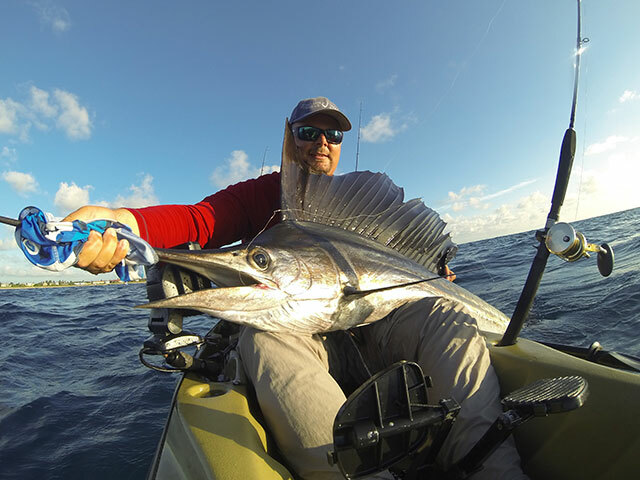 Nelli even targets sailfish and sharks from his kayak. 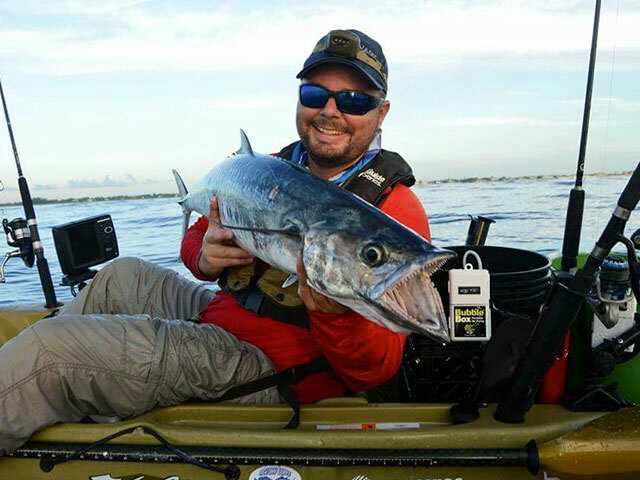 There's really no fish you can't land on a kayak, but if you want to get in on this offshore craze, it's best to book a trip with a pro before you invest in a kayak of your own. To learn more about kayak fishing in the south Florida area, visit tckayakfishing.com. Ten years ago Peter Hinck needed an offshore fishing partner. Since few anglers probed the deep water off Palm Beach, Florida, with a kayak, his options were limited. He could either sit at home or fish inshore. Or, he could recruit someone. In the early to mid-2000s, Hinck and Nelli were local pioneers. Only a few folks fished from kayaks then and even fewer were bold enough to go offshore. What was once a niche, however, is now a trend. The main reason for the surge in big-water popularity is simple economics. Kayaks are affordable. A used one runs less than $1,000, there’s no gas and minimal upkeep compared to an offshore boat. “With the economy being terrible, people were selling their boats and they wanted a way to fish and have a way to get into it,” Nelli says. Safety is a big, big issue when kayak fishing. If you fish in the Intracoastal, the risk is minimal. If you capsize, you can probably swim to shore. Capsize in the ocean, and you can find yourself in big trouble. Always fish with a partner, if at all possible. If you’re confident enough to go solo, file a float plan. Safety begins with the right equipment: A life jacket, a marine radio, a cell phone and GPS are critical. Wear your vest. Don’t stow it. It does you no good unless you’re wearing it along with a mandatory whistle. The marine radio provides updates on the weather and allows communication with other boaters. A phone does much of the same. Not all kayaks are created equal. Inshore yaks are typically wider and more stable. For offshore, it’s important to have a kayak that can handle chop and paddles well. The first fishing kayaks were traditional, paddle-powered boats but many anglers now utilize pedals, which allows hands-free fishing. Nelli uses the 12-foot Hobie Mirage Outback. Traditional paddling will get still the job done offshore but buy the lightest carbon-fiber paddle you can afford. Your arms will thank you after six hours on the water. The most overlooked element of comfort is the seat. Hinck has a raised chair-back seat, a design that Native Ultimate developed. The few inches of elevation keeps his legs and feet from cramping. The most important item you will need other than the standard safety equipment is a fish finder. Hinck first used a Humminbird Matrix 67 and stressed its significance during one of his popular YouTube videos. His favorite spots are ledges and wrecks, which can be located using Navionics charts. A lot of kayaks offer room for live wells, but Hinck prefers more of a minimalist approach. He fishes artificials only. But even though he doesn’t fish with bait, he packs plenty of gear, including a double-insulated fish bag with several frozen water bottles, which, once thawed, prevent dehydration after they serve their purpose of cooling his catch. As for rods and reels, keep it simple, one for live bait, one for jigging and one for pitching. Reels should be in the 6,000-8,000 range, but can vary depending on one’s preference to fish lighter. Thirty to 50-pound braid is the standard line. Your species of fish will vary, depending on when and where you fish. Hinck and Nelli both developed their offshore skills near Jupiter, Florida, where the Gulf Stream runs close to shore, providing a smorgasbord of angling opportunity for the aspiring kayaker -- everything from tarpon to little tunny. Sailfish, dolphin and tuna are also possibilities. To get to the fish, you may have to launch in the surf. Fish on flat, calm days. Hinck won’t fish unless the surf is one to two feet or lower. It’s no fun being out there in rough seas and other boats will have a hard time seeing you. Nelli, a full-time guide, is a bit more daring, but still cautious, particularly with clients. “Back in the day, I’d go out when you really shouldn’t, in five, six-foot waves. I mean, you learn that it’s not worth it to do that,” Nelli says. Currents can be steady, swift and a bit tricky, so chances are you won’t return to your actual launch point. The best thing to do is arrange a shuttle beforehand. Then there’s the fish. Boating a big mahi or king mackerel when you’re sitting on the water is no easy task and can be a safety issue. Either use a drift chute, which is similar to a sea anchor or throw your fishing partner a line, so your quarry will have to tow two kayaks. This should tire the fish out and make it easier to boat. Offshore kayak fishing can be rewarding and challenging. If you’re a newcomer, go with an experienced friend or hire a guide before investing in a kayak of your own. Nelli guides out of the Palm Beach area. For information, go to tckayakfishing.com.